This twice baked potato recipe has the delicious addition of baked garlic. Baking garlic removes the sharp edge it can have taste-wise, and leaves it soft, sweet and wonderfully savory. The chicken broth in this recipe adds a bit of richness and more flavor. Feel free to substitute vegetable broth if you wish. Pierce the potatoes several times and place on baking sheet. Wrap garlic in foil and place along side the potatoes. Bake in a preheated 425ºF (220ºC) oven for 50 to 60 minutes or until potatoes are tender and garlic is browned and softened. Let potatoes and garlic cool for about 15 minutes or until you are able to handle them. Halve potatoes lengthwise and scoop the pulp into a large bowl, leaving the skins intact and a bit of potato lining the skin. Cut the garlic head in half, squeeze out the pulp and add to the potato. Add the broth, salt and pepper and sour cream. Stir and mash with a fork until you achieve the desired texture. Spoon the stuffing back into the potato skins and sprinkle the tops with cheese. Return the potatoes to the baking sheet and bake about 15 minutes or until heated through and lightly brown. You can add a bit of chopped green onion or pieces of steamed broccoli for color and extra flavor before serving. 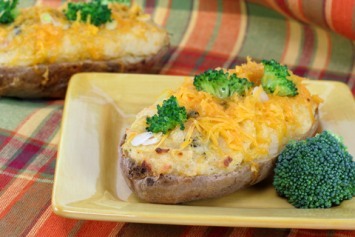 Other options for stuffed potatoes are grilled onions; chopped, crisply cooked bacon; cheddar cheese; chopped green onions or chives; sweet corn kernels; chopped cooked bits of broccoli, seafood or beans. The recipe calls for an entire head of garlic, which I think works perfectly for this recipe, but if you don’t like garlic much (or really love it), feel free to adjust the amount to your own taste. The sour cream adds a creamy tartness. And of course, wonderful Parmesan cheese on top. Can’t beat it. Stuffed baked potatoes don’t take a lot longer to make than regular baked potatoes. Just make them a bit ahead so you have time to stuff and rebake them before the rest of the meal is ready. The extra bit of time is definitely worth it for the delight of these garlicky, cheesy twice baked potatoes. Like this recipe? I’d love you to Pin it to Pinterest, Tweet about it, Like it on Facebook and leave a comment at the bottom of the page. What would be delicious with stuffed potatoes? Try our steak and ale recipe or one of our marinated flank steak recipes.